You know those rare occasions when your soap or shower gel is so moisturising that you can forgo moisturiser altogether once you're out of the shower? Lush Yog Nog is pretty much that. And a whole lot more. Now I know that Yog Nog is not a new Christmas release but I only tried it for the first time last night. Late to the party? Yes. Disappointed in myself for not trying it when it was released last Christmas? Bitterly disappointed. Bitterly. 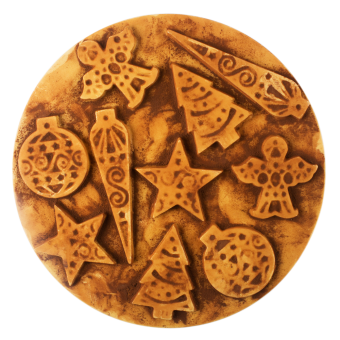 Lush describe Yog Nog as: A creamy Christmas tipple of a soap made with moisturising soya yoghurt and a dash of spicy clove bud. Indulge your senses in a fudgy lather with ylang ylang, moisturising Fair Trade cocoa butter and stimulating nutmeg. Dusted with a generous amount of aromatic fair trade cocoa powder, after one wash you’ll be ready to don your best Christmas knitwear. As is always the case with Lush, this description is pretty much spot on. The creamy soya yoghurt base of the soap combined with nutmeg, clove and cocoa butter do all kinds of glorious things to my nostrils and evoke everything I love about Autumn/Winter and the festive season. The scent reminds me of spiced chai, crunchy leaves, Starbucks Eggnog Lattes with a hefty dollop of cream and all the Yankee Candles that smell like they're freshly baked and ready to eat. The scent lingers for a while afterwards, so the party continues for a few hours after I've lathered up with it. The consistency is just what you'd expect from a Lush soap- creamier and more melty than your average- I can almost feel my skin drinking it in. Also, just look at the design. LOOK. So festive. I think it's safe to say that Yog Nog has replaced Snow Fairy as my top Christmas product from Lush. Now I just need to get my hands on the bath bomb. 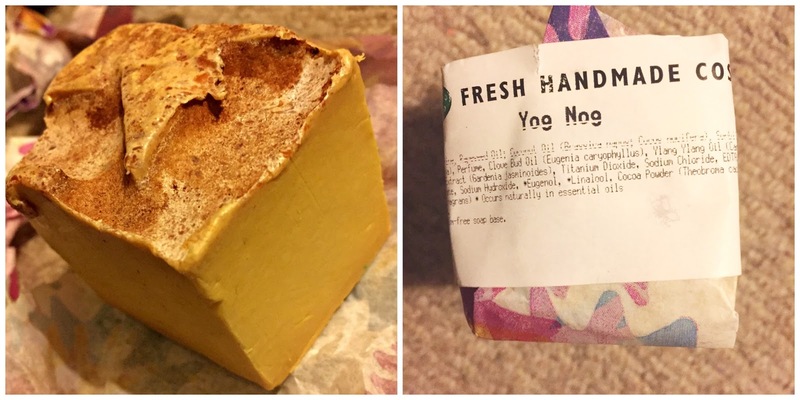 As a final note, Lush, if you are reading this (which you are almost certainly not) please make a Yog Nog body cream so I can smell like Christmas whenever I like. Thank you.